Thank you for visiting the website of The Friends of The Keep Archives. The Friends of The Keep Archives are working in ever closer collaboration with The Keep and its three constituent organisations. The Keep is a major new archive centre in the Falmer area of Brighton. It is a shared facility, housing the East Sussex Record Office, the local history collection of the Royal Pavilion and Museums of Brighton and Hove, and the University of Sussex Special Collections, including the Mass Observation Archive. It also houses the Sussex Family History Group. 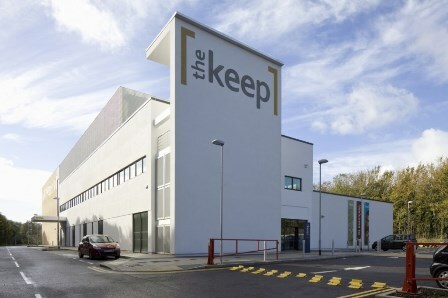 The Keep provides single integrated public access for the three archive services, state of the art preservation and conservation of records of all kinds and an unparalleled resource for learning and research. The Keep website provides further detail about its unique content, its excellent events and how to search the collections. It contains information, archives, resources and multimedia on a vast range of topics: anyone can explore these topics in various ways by simply entering a search term on the site. ​Why Does The Keep Need Friends? The Keep needs Friends now – more than ever before. Why? Core funding, for the acquisition and maintenance of The Keep archives, is a public responsibility, but for years, and most acutely now, public funding has been unable to keep pace with the vast amount of material which we and future generations want to see preserved. For information on this, read Core funding 2019/20. The Keep also benefits from the work of volunteers, many of whom are Friends. There are over 200 Friends of The Keep Archives. There are no special requirements or qualifications to become a Friend. Members come from all walks of life: some are learned historians, some with a more general interest. What unites them, though, is a fascination with their heritage. ​Why should I become a Friend? Friends receive a Newsletter twice a year, and an Annual Accessions Report which illustrates the wide range of acquisitions to which the FoTKA has contributed. Members have the opportunity to participate in visits to places of interest, often not open to the general public, with the benefit of expert guides. An increasing number of events and visits are planned for the future. Our AGM features a lecture by a distinguished scholar. Whether it is knowledge of the acquisitions, enjoyment of visits and special events, or meeting like-minded people, there is something for every member. ​If you decide to join, you will be among Friends! Membership costs only £18 a year for individual or £25 a year for joint membership. Please click on the application form on the right to download it for completion, then send it with your payment to the Membership Secretary, Friends of The Keep Archives, The Keep, Woollards Way, Brighton BN1 9BP.